Students used to riot on college campuses to send a message, in protest, to the powers that be: they wanted to end racism, protest our involvement in the Vietnam War, or force people in power to hear their message about some political cause. But that was then. Now, the Huffington Post reports, the only message college students seem to be sending forth from riots is that they’re drunk. 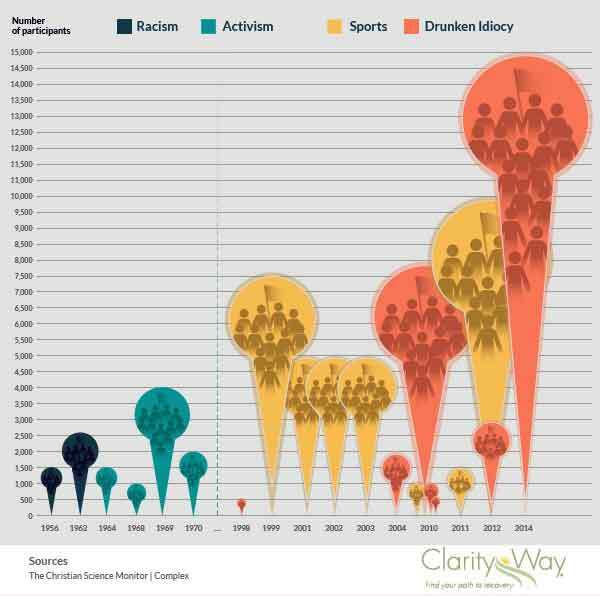 The graphic here, sent to us by the designer and used with her permission, shows the underlying reasons college students have rioted since the 1950s. Indeed, the reasons, once almost entirely about seeking justice, right or wrong, have shifted over the decades to plain old “drunken idiocy,” according to Clarity Way, a drug and alcohol rehab center in Hanover, Pa.
“College Riot Culture” by Adrienne Erin, Clarity Way. Used with permission. The biggest college riot to date was the “Deltopia” celebration at the University of California, Santa Barbara, on Saturday, April 5, 2014. It involved about 15,000 people, according to a report in the Daily Nexus, UCSB’s student newspaper, and there were at least 100 arrests and 44 injuries. Ironically—or maybe not so ironically—researchers at UCSB, including Kristen Sullivan and Merith Cosden, had just completed a major study, published late last year in the Journal of Child & Adolescent Substance Abuse and entitled “High School Risk Factors Associated With Alcohol Trajectories and College Alcohol Use.” The study’s premise is that the majority of college students who abuse alcohol started abusing it in high school. The study doesn’t specifically describe the tendency of college students who get drunk to riot, but it does identify some important risk factors that predict whether college students will abuse alcohol before they reach the legal drinking age. Although classified as a sports riot, since it erupted after the University of Kentucky defeated the University of Louisville in a Final Four basketball game, alcohol was everywhere, a spokesperson for the city was quoted as saying. Michigan State University is known for a passionate fan base, but when the men’s basketball team lost a Final Four game to Duke on March 27, 1999, between 5,000 and 10,000 people took to the streets, USA Today reported. Fans set fire to anything in their path, 132 people were arrested, including 71 students, and 24 were charged in connection with the riot—charged with arson, disorderly conduct, and, of course, underage drinking. Again, since this riot followed a sporting event, we have classified it as a sports riot. But make no mistake, there was plenty of alcohol consumed in East Lansing that night. The scene was described as “raucous” with bonfires, looting, drunken brawls, flying beer bottles, and walls of troopers in riot gear. It was the second year in a row for riots on the College Park campus, both times following basketball games (see #7). Police arrested more than a dozen people. “Students increasingly view celebratory riots as ‘tradition’ at Ohio State,” said a report entitled “Summary of Current Research on Celebratory Disturbances.” The Ohio State-Michigan rivalry in football is well documented, even once in a special sports documentary on HBO. But when one student tells researchers that winning a game against Michigan gave students the “right to riot,” we have a problem. So on November 23, 2002, when Ohio State did win the game, 14-9, earning them a national championship, fans rushed the field then took to the streets. Cars were rolled over, and several objects were set on fire. About 70 people were arrested, and emergency workers were called on to extinguish 107 fires, according to reports. The president of Ohio State, before the Michigan game, even urged students to “think, use moderation and show respect.” She said her office was flooded with e-mails criticizing the suggestion. “They thought I was attacking or trying to take away the very essence of Ohio State football,” she said, the NCAA reported on March 3. After their team’s 22-point lead vanished in the national semifinal men’s basketball game against Duke, students from the University of Maryland started fires along US Route 1 on the College Park campus. One bonfire got way out of control, the Chronicle from Duke University reported. Damage was estimated to be about half a million dollars in the riots on April 1, 2001. Also set on fire was one mobile home. Several student riots took place at the University of California, Berkeley, in the late 1960s. We have therefore combined the number of students involved and estimated it in the thousands. The riots were spurred by the Free Speech Movement, according to documentation held in the Bancroft Library at UCB. The library’s website keeps alive the memory of Mario Savio, the FSM’s most charismatic leader, who died in 1996, but there really isn’t one picture or one account that can do justice to this period in US history, when the Free Speech, anti-Vietnam War, and Civil Rights movements all came to a head. Protesters launched events like “Stop the Draft Week” and the Vietnam Day March, all of which would be considered part of this movement at UCB. One incident, known as the Sheraton Palace Demonstration, saw nearly 4,000 people occupy a hotel that discriminated based on race in its hiring practices. The students demanded that blacks have access to executive positions. This riot is not the famous Kent State riot of 1970 (see #12). Rather this is the riot that erupted on Saturday, April 21, 2012, at College Fest, an annual block party around the end of the school year. It got a little out of control, and 33 people were arrested as crowds became unruly. Of those arrests, seven were juveniles charged with curfew violations and underage drinking. Bricks and bottles were thrown at police officers, the ABC affiliate in Cleveland, newsnet5, reported. On Oct 1, 1962, Ole Miss admitted James Meredith, the first black man to be offered admission to the university, NPR reported. The town went berserk, and about 30,000 US troops, federal marshals, and national guardsmen were called in, just to get Mr Meredith to class. The riots killed two people and injured more than 300. “I’m a Mississippi segregationist and I am proud of it,” NPR quoted Gov Ross Barnett as saying as he defied President John F Kennedy’s order to allow Mr Meredith in the classrooms of the university. The facts were apparent in the hours after a riot erupted [in the] early morning, [Sunday, April 18, 2004], but accountability was less clear as the Campustown and ISU communities surveyed the damage. … [A] party on the 2600 block of Hunt Street … was spilling out into the street. Ames police estimated about 400 people were at the party. The group then moved down to Welch Avenue and two groups began to form: one at the southern part of Welch Avenue and the other at Lincoln Way and Welch Avenue. The National Guard fired 67 rounds at a crowd of people on campus who were protesting the invasion of Cambodia, which was announced on TV by President Richard M Nixon on April 30. The incident, which began on May 1, goes by many names—from the “May 4 Massacre” to the “Kent State Massacre.” It caused a sweeping national response, as schools closed because millions of students went “on strike,” including high school and college students. Four protesters were killed and nine injured in the shootings. Fifty years ago, the University of California, Berkeley, expelled several students involved in the Free Speech Movement, led by Mario Savio. The movement’s supporters protested the university’s actions in the fall semester of 1964, culminating in the largest demonstration ever staged by the FSM: About 1,500 students occupied Sproul Hall. A total of about 750 students were arrested and forcibly removed from the building. A man named Jack Weinberg was the first to be arrested, and thousands of demonstrators surrounded the police car in which he was detained for 32 hours. But the university, realizing it could not survive without tuition from all those FSM supporters, gave in. Shortly after the protests, Ronald Reagan, just before he became governor of California, said the protest’s ringleaders should be “taken by the scruff of the neck and thrown out of the university once and for all.” But, as so often happens, the targets of protests in the 1960s have mended their ways. “The university is taking ownership of its own history, and that’s really healthy,” the Los Angeles Times quoted historian Robert Cohen, a professor from New York University who is teaching this term at Berkeley, as saying. The first test of the US Supreme Court’s landmark ruling in Brown v Board of Education happened before the ruling had even been issued as the supreme law of the land. In the fall semester of 1952, Autherine Lucy, a black woman, was admitted to the University of Alabama in Tuscaloosa. She was welcomed by students and faculty, but you’d have never known it by the protests outside school walls. In midnight riots and a cross-burning ritual in February 1956, attended by about 1,500 people, crowds cried, “Keep ‘Bama white” and “To hell with Autherine.” Ms Lucy had to be escorted off campus in a police car, and university officials, telling her that state law barred African-Americans from attending the university, suspended her, they said, for her own safety. Ms Lucy, with the help of Thurgood Marshall, sued the university for failing to protect her. Although she won her discrimination case and was ordered by the court to be allowed to attend Alabama, the university used the suit she had filed against it as grounds for her expulsion. She had slandered the school in her filings, they said. The storied football program at Penn State University, led by Joe Paterno, was turned upside down by a scandal involving the sexual abuse of young boys over the course of 15 years. Jerry Sandusky, a former assistant football coach for the Nittany Lions, was charged and convicted of multiple counts of sexual abuse of children. As the leader of the program that failed to shine a light on these misdeeds, Joe Paterno was dismissed. In late 2011, more than 1,000 Penn State students took to the streets, chanting slogans like, “Hell no, Joe won’t go.” The protest may have ended due to rain more than any police show or use of force, the Reuters news agency reported. A power failure late in the night on April 6, 2010, in a neighborhood near the Seattle campus of the University of Washington gave about 1,000 students the opportunity to start a riot on Fraternity Row, United Press International reports. The riots continued for about two hours, although utility crews were able to repair a downed tree and restore power within about 45 minutes. Couches were set on fire in the streets, and on at least two occasions, the crowd failed to disperse in response to police orders. At Columbia, as elsewhere, students were reeling. A memorial service for King was disrupted in protest against Columbia’s plans to build a gymnasium on public park land that offered only limited backdoor access to residents of nearby Harlem. An official of the Selective Service System was hit by a lemon meringue pie during a talk on campus, a protest against the draft and the university’s involvement with the Institute for Defense Analyses, which did weapons research for the war in Vietnam. A group of students, up to about 1,000 of them, therefore occupied campus buildings for almost a week, beginning on April 23. Police used tear gas to eject them. More than 700 students were arrested, but their mission was accomplished: the gym was never finished. In the years after the riots, well-publicized murders and numerous muggings occurred in Morningside Park, the New York Times reported. Even as late as 2001, Columbia students were being warned to keep out of the park, just as they were in 1968. A riot followed a Wednesday, March 3, 2010, victory by the Maryland Terrapins over the Blue Devils from Duke University, who were ranked fourth in the country at the time. Students reportedly threw snowballs and ice at police, and 28 people were arrested, mostly charged with destruction of property. The riot sparked a debate between police and students over how to handle rioting sports fans, who are drunk, in the future, the Washington Post reported. Police showed up at a late-night kegger, which had stretched into the early morning of Sunday, May 3, 1998, on the campus of Washington State, where an on-campus drinking ban was in effect. When they arrived, students threw garbage and construction materials at them. When police backup arrived, mere observers joined in the riot, causing the crowd to swell from about 200 to nearly 500 drunk rioters. At least 24 police officers were injured, six seriously, the Seattle Times reported. Police car windows were smashed, and numerous fires set along “Greek Row.” Some people estimated the crowd to be as high as 2,000. However, the riot wasn’t just “a fluke, a strange combination of exam stress, a beautiful day and enough alcohol to put a horse in a coma,” the paper observed, since three other universities had experienced riots that weekend, including Michigan State University, where about 3,000 students, some throwing bottles and rocks and setting fires, clashed with police during a protest over new rules on the use of alcohol before school football games. The long list of alcohol-related uprisings on college campuses is sobering, but Scott Jaschik, an editor at the Chronicle of Higher Education, told the Times in that same article that controlling drinking is a tough issue: Colleges feel pressure from parents and politicians to limit illegal alcohol consumption. But to stop a freshman from drinking is a naïve notion, he said. If students are forced not to drink on campus, they’re likely to drink off-campus. To do that, they’ll also have to drive. Police at the University of Oregon tried to break up a party on Friday night, Sept 24, 2010, and about 400 party-goers started trashing local streets, the Huffington Post reports. The group threw bottles and eggs at police, who used several cans of tear gas to subdue and disperse the crowd. Police said there were no injuries and two arrests. Deaths, injuries, arrests, destruction of personal property, blemishes on the reputations of schools and students—these are the effects we have reported that come from underage drinking, especially on college campuses, where a mob mentality may develop. Furthermore, the best research we have shows that alcohol abuse and problem drinking start well before kids become college-aged adults. That’s why parental intervention and guidance is needed. Law enforcement comes into the picture too late in our children’s lives, and a lot of research suggests that pursuing education and treatment—either substance abuse or mental health treatment—in the fight against underage alcohol abuse is more effective than pursuing punishment through law enforcement. The importance of parents as “interventionists” is supported by reviews of the treatment literature … as well as the emerging science that home-based initiatives by parents can contribute to desired health changes in adolescents. … Parental influences on an adolescent can include reducing initiation, as well as altering its maintenance if it has started. This article describes a project aimed at helping parents to deal with a teenager who has already started to use alcohol or other drugs. Home Base is a home-based, parent-led program aimed at reversing the trajectory of drug use in an already drug-using adolescent. The program’s content is organized around motivational enhancement and cognitive behavioral techniques.